Faris's band were also playing the music festival and the indie rock musician shared his surprising taste in who he was most looking forward to seeing on stage. He said: "I really want to see Dolly Parton - I think she has an amazing brain, she's incredibly sharp. I especially like watching the 70s talk show interviews with her. "Despite the way she looks she's kind of a feminist really. She pulls the wool over people's eyes, it's funny. People often treat her like she's one dimensional and she's completely the opposite." 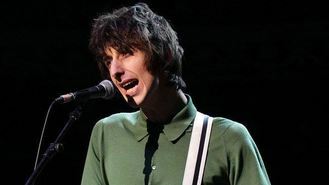 Faris also talked about how different it would be to play the Other Stage at Glastonbury, rather than the Park Stage which The Horrors are usually were booked for. He explained: "Probably one of my favourite gigs ever was the first time we played the Park Stage because it was just as the sun was going down. "We're on the Other Stage this time - I guess it's a bigger one, it's exciting. This is probably the most excited I've been about a gig for a long time."